A week ago, all our stuff moved into storage until we can close on our house in Pennsylvania. Luckily, my pal Jenn requested a few pictures of the boys gallery wall to help put hers together--so before our stuff left, I took a few shots of the gallery wall in the boys' room that I missed in the tour of their room from awhile ago. I'm fairly proud of how it turned out and don't want to forget that little corner of our house! I used a variety of frames (almost all from IKEA!) and a few canvasses. I love the way it looks. 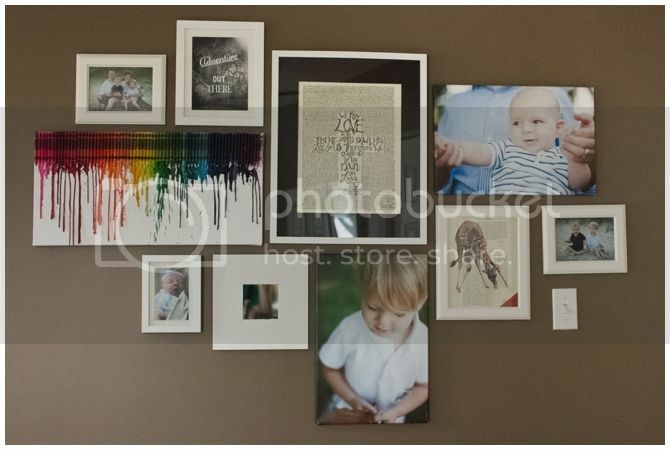 There's a zillion tutorials on Pinterest on how to make a gallery wall--this is not one of them. I'm pretty sure I made this by making a fake wall in Photoshop and arranging the frames until I was happy. Normal. There's a few photos from a beach trip last year and a photo of Braden the day he came home from the hospital. In case you want your own crayon canvas, that tutorial is here. The two photo canvasses are courtesy of Erica May--my favorite KC photographer. If you need an awesome photographer, you are going to have to wait because she's currently having a baby very very close to my baby! I also love these three prints. 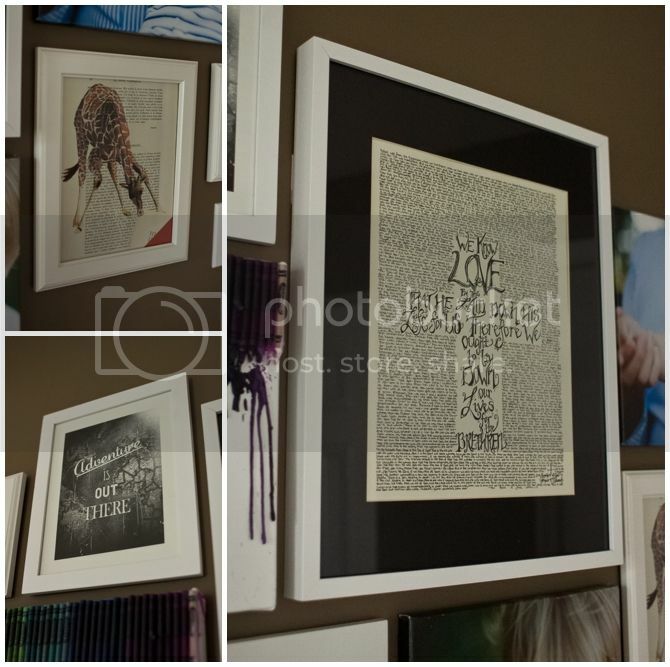 The giraffe print is from Etsy, and the UP quote is a gift from my thoughtful friend Carrie. The cross print was a wedding gift from one of Sol's groomsmen, Luke, who passed away in the years following our wedding, and is also Braden's namesake. I'm excited for a new house with more walls to cover with stuff.